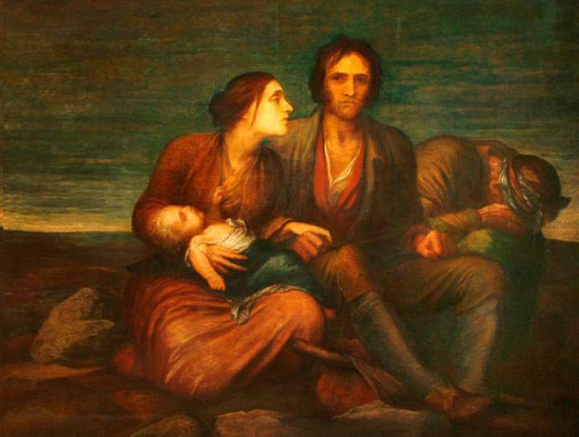 The Irish Famine, painted by George Frederic Watts c. 1848-1850, depicts a young family evicted from their home. The Watts Gallery. Schizophrenia and other diseases associated with starvation. It wasn’t until World War II, however, that the first scientific efforts were made to understand and chronicle the effects of starvation on the metabolism and circulation. The pioneers in this field were a score of Jewish doctors locked up by the Nazis in the Warsaw Ghetto. Victims as well as observers, these doctors methodically recorded the withering impact of caloric deprivation on bodily functions. There has never been much doubt that starvation has psychological as well as physiological consequences. But as Lizzie Collingham points out in her instructive and enlightening book, The Taste of War: World War II and the Battle for Food, it wasn’t until after the war that scientists got around to considering exactly what the long-term implications might be. The genetic scars and mutations inflicted by famine on the body and mind are still coming into focus. Yet it’s already clear that they are more punishing, profound, and enduring than previously imagined. Given the depth and duration of hunger in places like 19th-century Ireland, the legacy will probably never be properly reckoned. And today, with a billion people living day-to-day on the cusp of starvation—the majority of them women and their children—we can only wonder at what winds are being sown and what whirlwinds will be reaped.